The rise of cloud-based applications, growth in mobile workforces and BYOD policies creates new challenges for WAN decision-makers. However, organizations are rapidly adopting SD-WAN to help meet these next-generation WAN requirements. In this e-guide, learn from Lee Doyle, Principal Analyst at Doyle Research, about how a mature SD-WAN market can bring distributed networks up to speed with simplicity and automation. 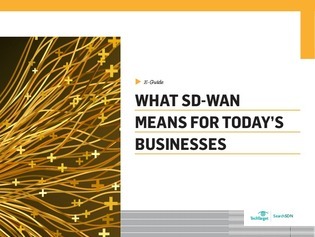 Then, find out how to exactly tailor SD-WAN for your business needs.